Gorgeous pair of hanging pink sapphire and diamond drop earrings. The greatest part is how perfectly the pink sapphires graduate in color from deep pink to light pink. The center section of the earrings hangs freely so there is flexible movement. 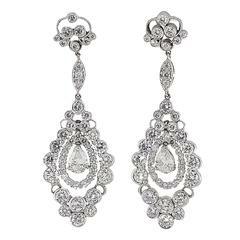 Great pair of earrings for dressy occasions but can also be worn casually. Total weight of sapphires is over 8 carats and the total weight of the diamonds is close to 2.50 carats.